No matter how intimate or grandiose your wedding will be, having a wedding run sheet for everyone who is involved in the planning of the wedding ceremony and reception keeps all the possible mistakes and problems during your actual wedding day. 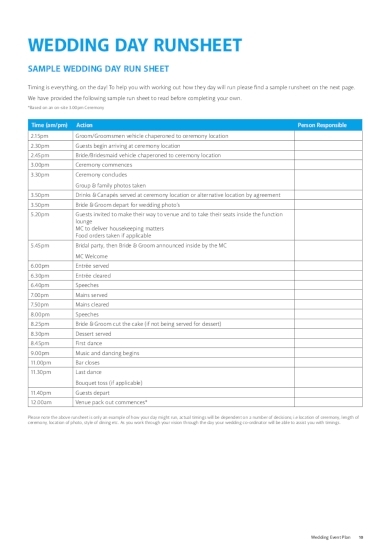 Such sheet templates can serve as your realistic time frame for every single activity that you have set and prepared for everyone on your big day. However, coming up with your own wedding run sheet involves planning particularly among the vendors, florist, caterers, wait staff, logistics team, and all those who are involved. And coming up with the actual sheet can also be time-consuming especially if you have no idea on how to do it. Lucky for you, we have already prepared you some of the best wedding run sheet examples and templates that will ensure that everyone involved in your big event will be coordinated according to your wedding itinerary or your wedding plans in general. Upon creating your own run sheet for the first time, it is greatly important that you find and use a template that you are comfortable with. 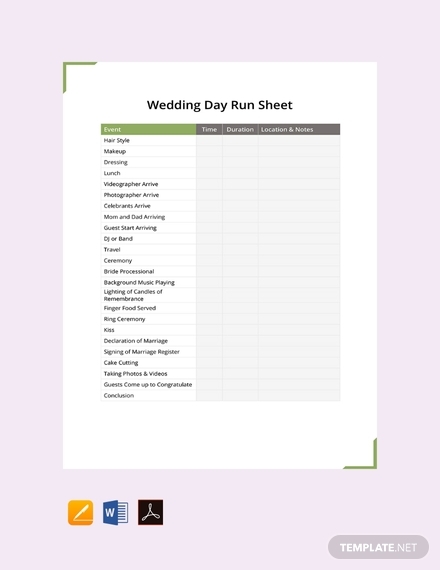 With the use of this wedding day run sheet that we have already provided for you, you will surely be comfortable using it. Aside from the fact that this template is customizable and editable using various formats, this template also contains a functional layout that you would no longer find the need to heavily customize it. Worry not for this template will surely get you covered and ensure you that every single aspect of your wedding event will be accounted for. If you are having a hard time coming up with your own run sheet especially if it is still your first time, you should consider using this basic wedding run sheet. True to its name, this basic wedding run sheet consists of the basic elements that you would basically need in a run sheet. 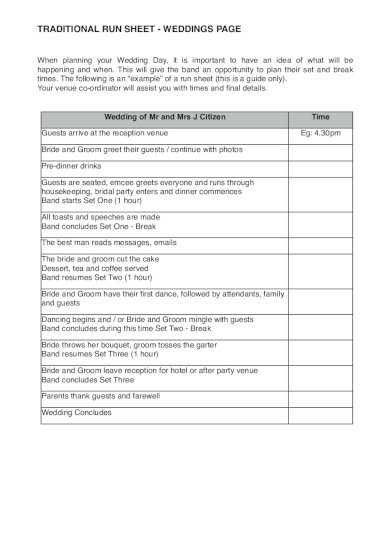 The sheet is divided according to the four basic events that would take place during wedding events, namely the pre-ceremony, the actual ceremony, canapes, and the wedding reception. And since it is categorized well, you and all those who are involved in your big event will be able to manage things well during your actual wedding day. 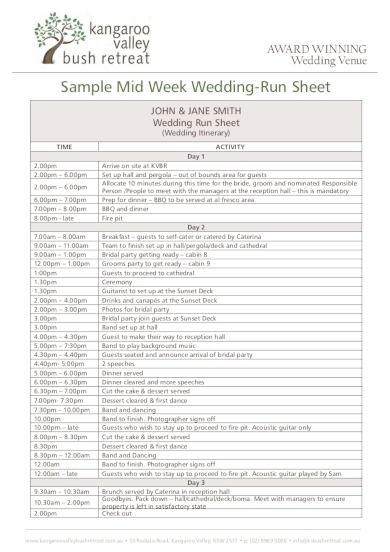 For weddings that are scheduled midweek, we have found the best run sheet that can help you with that. The given wedding sheet above contains really simple details such as the guests’ expected time of arrival at the reception venue, the time when photos should be taken, the customary wedding formalities, right until the very conclusions of the entire wedding event. And since you are going to hold your wedding at the middle of the week, your run sheet will help your guests prepare ahead of time so it will be possible for them to attend to your event. You can never have too much information on your wedding run sheet for as long as it contains relevant and helpful information for all of the people involved during your wedding day. 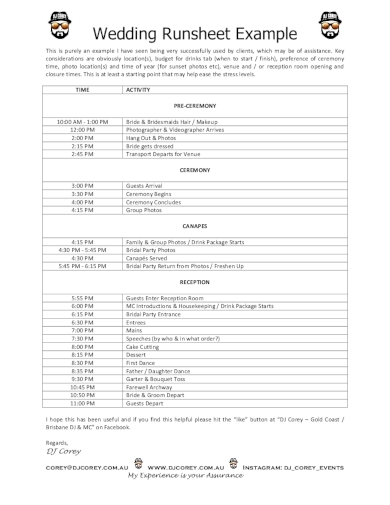 With the help of this run sheet, you are given the chance to clearly layout the setup times of vendors or caterers, the arrival times of service vehicles for your guests, the wedding photo shoot time, and even including the expected time of travel from the wedding ceremony venue to the reception venue. This template enables you to keep yourself guided with all of the common practices and formalities of every single wedding event such as the giving of speeches, cutting, dancing, tossing of the bouquet, and so on. When it comes to planning for your big day, it is imperative that you already have the idea of what is going to happen and when will it happen. Even if you are only going to set up just an intimate wedding, you still need to ensure that you have a bird’s eye view of what is bound to happen on our wedding day. All the more if you are going to set up a really big wedding, you would also need a very detailed and thorough run sheet that will help you in carrying out the success of your special day. At the end of the day, you have to acknowledge the fact that no matter how you plan things well, there is always the possibility that you will encounter challenges. So with this in mind, make sure that your wedding run sheet can easily adapt to all the possible changes that might happen during your big day. We hope this article has greatly helped and guided you in going in the right direction as you create and write your own wedding run sheet for the success of your wedding day.